Phi Phi Islands refer to a group of islands in Thailand, located between Thailand’s west coast mainland and Phuket Island. The islands are administered under Krabi Province. The largest & most populated of all Phi Phi Islands is Phi Phi Don. Koh Phi Phi Lee is equally popular. The island receives very many tourists. Other Phi Phi Islands include; Bida Nok, Mai Pai, Koh Yung and Bida Noi islands. It is important to note that some islands are simply huge limestone rocks protruding from the sea. Archaeological discoveries claim that Phi Phi islands were home to Thailand’s oldest communities. The islands date back to prehistoric times. The islands get their name from the Malay word Phi which means fiery tree or gray mangrove. Gray mangroves are very common on the islands. Phi Phi Islands is a name used to refer to a group of six islands. The islands are located 40 kilometers southeast of Phuket. The islands are part of the Hadnopparattara National Park, which features abundant marine wildlife and corals. The islands feature limestone mountains with caves and cliffs. The islands also feature long magnificent white sandy beaches. Of all six Phi Phi Islands, the largest & most popular are Phi Phi Lee and Phi Phi Don. Phi Phi Don measures 9.73 square kilometers while Phi Phi Le measures 2 square kilometers. 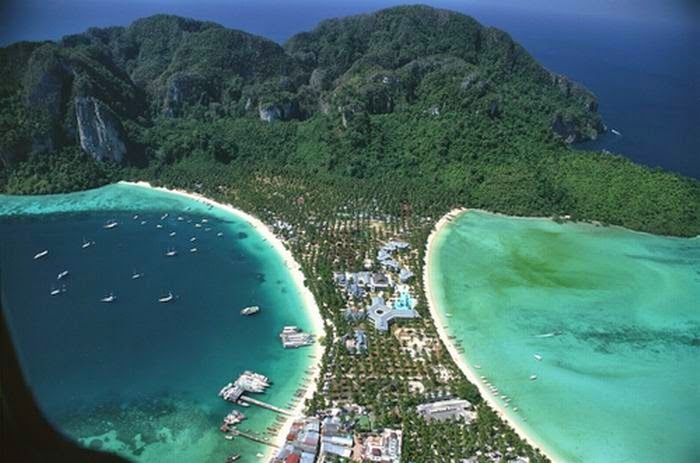 In total, Phi Phi Islands measure 12-square kilometers. The main economic activity in Phi Phi Islands is tourism. The islands attract very many tourists from all corners of the world because of many things the most notable being the islands’ magnificent beaches with clear waters, marine life and natural beauty. Tourism became popular in the islands when they were showcased in the popular 1990s movie; “The Beach.” In the beginning, the islands were frequented by adventurous travelers interested in basic accommodation only. Today, the islands host all kinds of tourists because of the presence of world-class accommodation on the larger island. Tourists from Koh Samui and Phuket frequent Phi Phi Islands to enjoy the marine fauna and coral reefs, as well as stay in the world class resorts in the 2 largest islands. Phi Phi islands like Ko Phi Phi are popular for snorkelling, kayaking and scuba diving among many other water sports and marine recreational activities. The islands are located near airports located in Trang, Phuket and Krabi. All these three airports have transport connections, i.e. ferry or boat connections to Phi Phi Islands. The most popular mode of transport to and from the islands is ferry transport. There are very many ferries which carry people from the islands to the mainland and other islands. Ferries are usually available from as early as 7.00 am till late at night. In regards to communication, Phi Phi Don hosts a post office, which serves the islands. Tourists can buy postcards, aerograms, stamps and send letters. Services such as EMS, registered post and parcel services can be organized from the post office which is open from Monday to Saturday between 10am and 6pm (except during bank holidays). John Chen is a travel writer currently located in Bangkok, Thailand. He likes writing about Thailand and he writes not only about traveling in Thailand, but also about business, culture, economy, education and food.